I’ve had many buffalo chicken dips in the past and this is by far my favorite of them all. It’s creamy, so full of flavor and has just the right amount of heat. 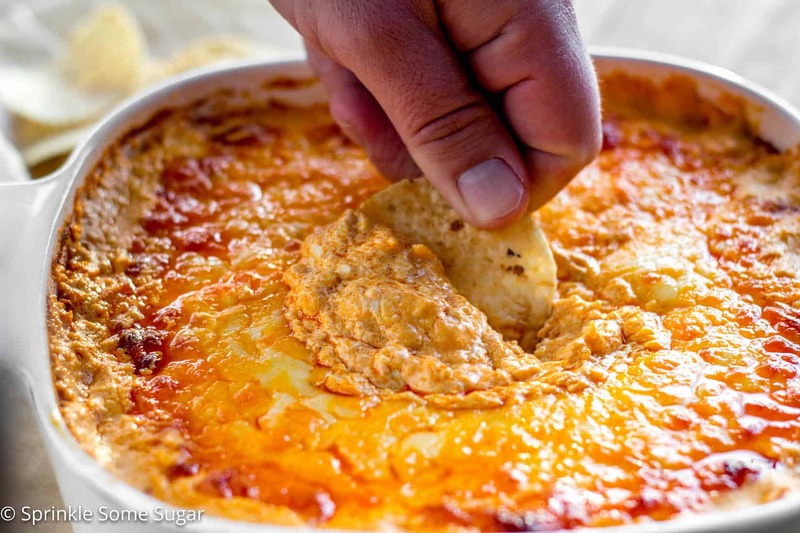 You can use more or less hot sauce depending on how spicy you want it but with all the cooling, creamy ingredients in this dip, it’s the perfect amount for me. This recipe uses fresh chicle breasts that you boil and then shred. To shred my chicken quickly and smaller than I would get with two forks, I pulsed each breast in a food processor a few times to break it up then added it to my dip ingredients. Using fresh chicken breasts tastes so much better than canned chicken – yuck. If that is all you have on hand though, feel free to use it. Once the ingredients are all mixed together and the chicken is added, you’ll pour the dip into a lightly greased baking dish, add some more shredded cheese on top and bake it until the cheese is a little brown and bubbly. Then dig in with your favorite dippers! In a medium pot, boil chicken breasts until cooked through. Pulse in a food processor a few times to shred. Set aside. Preheat oven to 350 degrees F and lightly grease a 9x9 baking dish. Set aside. In a large bowl, using a hand mixer, beat cream cheese, sour cream, mayo, hot sauce, both dressings and all spices until smooth. Fold in 3/4 cup cheddar cheese, 1/2 cup monterey jack cheese and 1/2 cup mozzarella cheese. Place the remaining cheeses in a bowl and toss together. 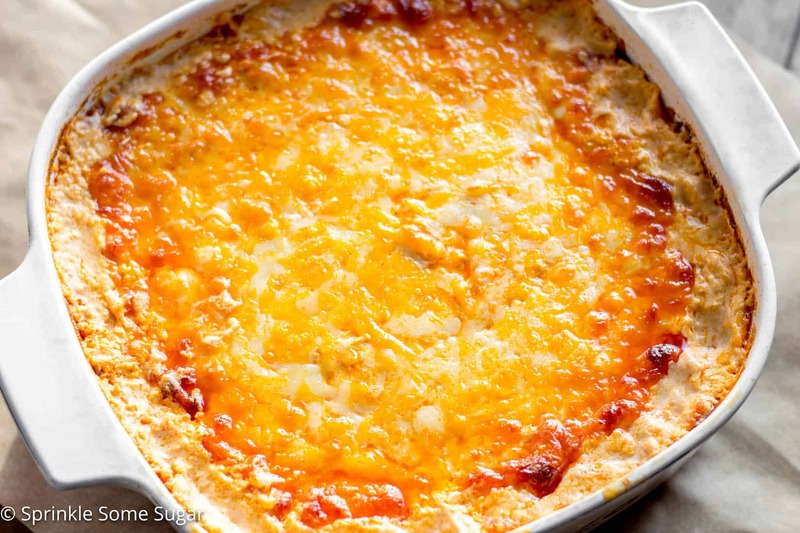 Pour dip into prepared baking dish and top with leftover cheese. Bake for 30-35 minutes OR until the cheesy is melted, lightly browned and bubbly. Serve hot. 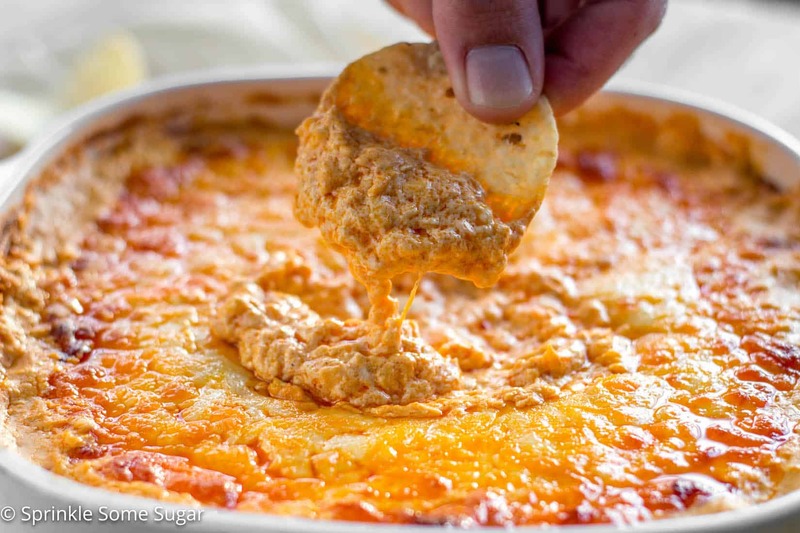 I love Buffalo chicken dip, and now I’m so hungry for this! One of my favorite treats! Love the heat and all of that cheese! Love these flavors… I would eat so much of this! We love cheesy dips! This is perfect for our next party! I LOVE this cheesy dip!! I can’t wait to try it!! Looks incredible!! So wishing I could reach through my screen for some of that melty goodness! One of the best dips ever! Now I want to have this before I go to bed! I followed this recipe exactly as recommended and it was an absolute hit with the crowd. It was enough to feed about 8 people as an appetizer with chips and a little bit of salsa on the side (salsa barely touched). This is definitely my new go-to appetizer for parties. Thank you! is there a specific time you add the chicken to the cheeses? Could this be adapted to be done in a crockpot so it stays warm? Love this dip, always a big hit! Makes so much that needs to be foe a party rather than just a couple of people. I made this two ways for the Superbowl one with chicken I used thin sliced chicken breast which i seasong with Montreal Chicken season and seared gave it more flavor. Everybody loved it. Second way was Roasted Cauliflower and Chick peas one of the guest tried to keep it for themselves! It’s not cheap, but your worth it! Delicious! It’s not cheap….but you are worth it! Delicious!